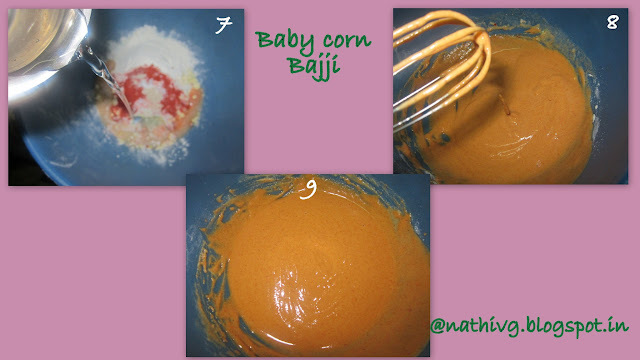 Baby corn is a cereal grain taken from corn(maize) harvested early while the ears are very small and immature. It typically is eaten whole-cob included-in contrasts to mature corn. Baby corn is eaten both raw and cooked. It is most common in Asian Cuisine. In larger variety of corn we can not eat middle stem, but in baby corn we can eat the tender middle stem also and it looks pale yellow in color. 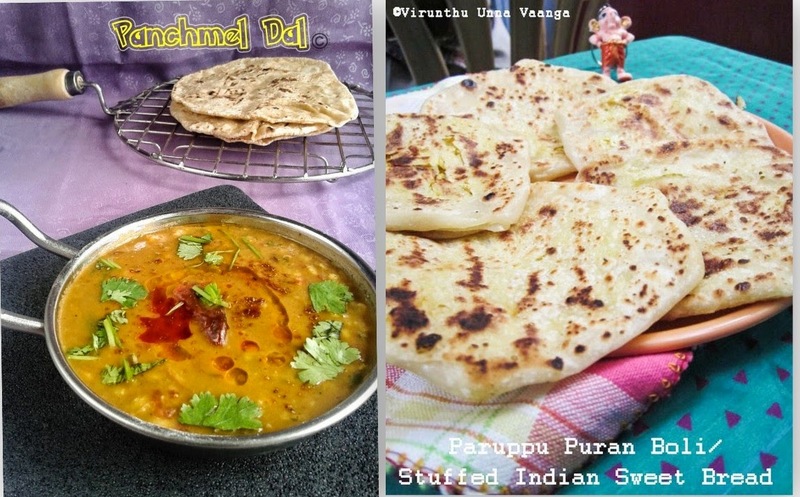 Combine gram flour, rice flour, red chilli powder, soda, hing and salt in a bowl and mix it thoroughly with adding of little water. It should be in semi liquid consistency mean neither thin nor thick. Chopped the baby corn into small pieces like finger size and keep it aside. Heat oil in pan for deep frying in high-medium flame, take one piece of corn and dipped into the mixture fully till well coated with batter. 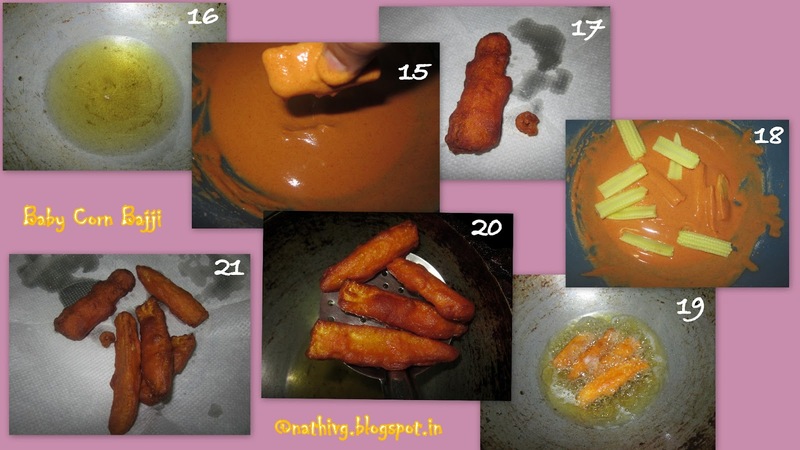 Drop into oil and fry till turns golden brown, do the same for remaining corns. That is so crispy and crunchy!!! 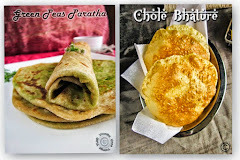 so perfect with coffee and tea!!! 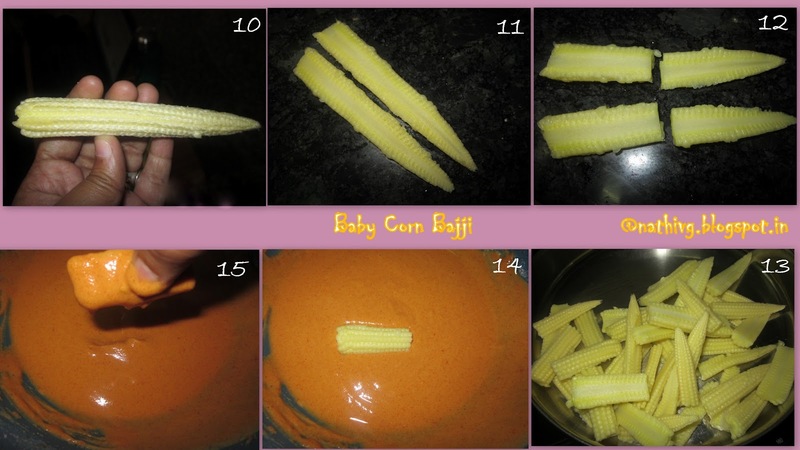 crip oooh!my fav baji in baby corn.perfect snack. Crunchy and crispy mouthwatering baby corn fries, very neat presentation sister. This is my favorite but too lazy to make some...can I grab a few? Superb!!! 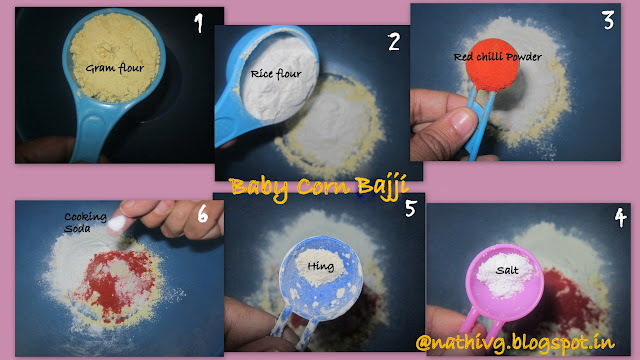 Crispy, crunchy baby corn bajji..
i am wondering about the colour without adding the color powder ! 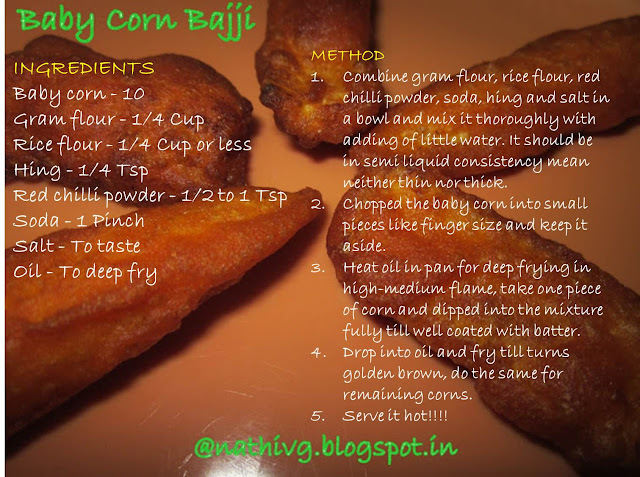 This bajji is my all time fav one lovely and crispy. Its tempting me dear!! I and my grand ma love this very much!!! My son too!!! So crispy and very tempting..